I received this letter from Dr. Michael Snyderman, the Director of Clinical Oncology for the WPI, this morning. I am posting it with permission. He is hoping to lend some balance to the discussion. This is what one doctor did with early testing, even before the scientific process had run its course, since he would have been dead before ever starting treatment had he been unable to connect the dots. It is a shame that the WPI has lost time from having to be on the defensive. I am a believer in MLRVs causing human disease. The supporting data actually goes back to the 1970s. Three different research labs including Robert Gallo’s the co-discoverer of HIV found MLRVs in many different types of lymphoma and leukemia. I believed in “XMRV” enough that when Dr. Mikovits told me that my blood sample was positive, I put myself on AZT and raltegravir for my chronic lymphocytic leukemia and CFS. At the time I started treatment (5/27/10) both were getting worse quickly. I had no treatment for cancer or CFS prior to ARV’s. I have been a hematologist/oncologist for 40 years. I am tired and am not cured but I am improved at 11 months on treatment. Both the leukemia and the CFS improved coincident with disappearance of infectious virus from my plasma. 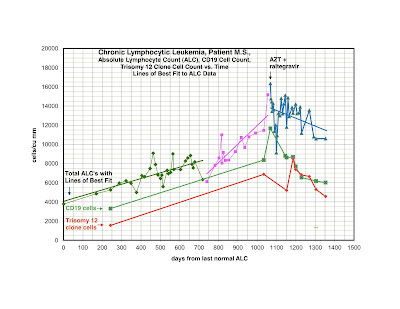 I am plotting total lymphocyte count, total B-cells (CD19) and an unfavorable clone of CLL cells (trisomy12). As you can see, my counts were going up rapidly and now are slowly improving. To my eye it looks convincing that there has been a definite biological change in the leukemia. I also feel somewhat less fatigued and my neuropathic pain is gone. Attached are my lymphocyte count, CD19 (leukemia cells) and trisomy 12 cells (the worst group of cells of my leukemia), as well as my original cytokine profile, vs. 9 months of treatment. There is no other reasonable explanation than that XMRV, or another retrovirus, was at least making things worse, and subtracting its influence has improved my disorders. This is proof of principle in my opinion. Obviously, an enormous amount of work needs to be done. For example, we don’t have a protease inhibitor, and ARVs are not going to be the only answer. My perspectives are mine, but I believe there is a scientific basis. I have B-cell CLL with unfavorable prognostic factors: doubling time < 1 year and trisomy 12. I also had the characteristic elevations of cytokines, fatigue and pain seen with CFS. I started AZT and raltegravir May 2010, because I felt things were deteriorating and I had little to lose. More importantly, if I was successful, it could translate into a treatment option for cancer patients that otherwise could not be helped. The use of ARVs for treatment of cancer is not new; it was used in the 1990s for treatment of HTLV-1 associated lymphoma and did help. I knew then that if I used it on patients I would be vulnerable to censure from my fellow oncologists. I look at the fact that I got CLL as the opportunity of a lifetime to do some good. I am a one person project. I hope sharing my data will encourage people that we will prevail. I will be submitting this data to an online Hematology Oncology journal soon. Some excerpts from the paper are included below. Review of murine leukemia virus-related viruses and malignancy and outcomes of anti-retroviral drug therapy in a Xenotropic Murine Leukemia Virus Related Virus XMRV positive patient with Chronic Fatigue Syndrome and chronic lymphocytic leukemia. Background: Xenotropic Murine Leukemia Virus-Related Virus (XMRV) was identified in 2006 in some patients with prostate cancer and first isolated in 2009 from most patients with the Chronic Fatigue Syndrome (CFS). Of a cohort of 300 patients with CFS from the 1984 Nevada outbreak, 13 developed B-cell malignancies. The 13 patients were positive for XMRV and a gd T-cell clonal expansion. Causality of XMRV associated CFS and malignancy can be addressed by treatment with anti-retroviral drugs. A patient with both CFS and CLL was available for study. Materials and Methods: Peripheral blood mononuclear cells were isolated. XMRV infection was detected by RT-PCR for gag and env expression; isolation of infectious virus and seroreactivity to XMRV antigens. Cytokine profiles were determined by multiplex analysis of 30 cytokines chemokines and growth factors on a Luminex platform. T-cell clonal expansion was determined by testing for clonal T-cell receptor gamma gene rearrangement (TCRg) by assays available from commercial clinical laboratories. Results: A patient with CFS and B-cell chronic lymphocytic leukemia (CLL) was positive for XMRV and clonal TCRg. He showed improvement in his cytokines, CFS symptoms and hematological parameters simultaneous with disappearance of infectious XMRV in plasma after treatment with AZT and raltegravir. Conclusions: Improvement of both the CFS and CLL simultaneous with disappearance of infectious XMRV from plasma after anti-retroviral therapy suggests that XMRV was etiological for both. Anti-retroviral therapy might have a positive impact on CFS and XMRV associated malignancy in other patients. A patient with CFS and B-cell CLL tested positive for XMRV in both plasma and leukemia cells. His virus was sequenced and was closely related to the previously sequenced XMRV strains in our laboratory. He had antibodies to XMRV proteins. He was also positive for a clonal TCRg by both quantitative and qualitative assays. He had unfavorable prognostic factors including a trisomy 12 clone and a doubling time of less than one year and had no prior therapy. He started treatment with AZT and raltegravir 571 days after diagnosis. 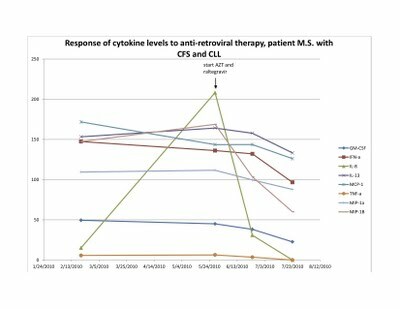 By day 56 of treatment, infectious XMRV was no longer detectable in plasma and his cytokine levels had improved. This coincided with improvement in symptoms of CFS which included fatigue, difficulty in concentration and neuropathic pain. He continues on treatment for eight months with good tolerance of drugs and works full time. His previously increasing absolute lymphocyte count (ALC), CD 19 cells and trisomy 12 cells are trending downward. At start of treatment, his ALC was 16,348/cu mm and CD 19 cells 11,658/cu mm up from 3,303 at diagnosis. His trisomy 12 cells peaked at 8,490/cu mm day 117 of treatment up from 1,550 at diagnosis. After 285 days of treatment his ALC was down to 10,600/cu mm, CD 19 cells down to 6,015 and trisomy 12 down to 4,558. We have previously reported that most CFS patients are positive for XMRV if multiple detection methods are used. The development of lymphoid malignancies in 13 of 300 CFS patients suggests that CFS patients are at a several hundred fold increased risk for malignancy compared to generally quoted incidences in the general population. Of these 13 patients, all that were tested were positive for both XMRV and a clonal gd T-cell expansion. The greatly increased risk for B-cell malignancy in an XMRV infected population may be due to infection of the B-cell line by XMRV. Cancers have mutated genes and changes in gene expression that could make them permissive to infection by retroviruses. Retroviruses have been thought to cause cancer by insertional mutagenisis. This mechanism requires that the retrovirus proviral DNA be integrated into host cell DNA next to a proto-oncogene thereby inducing activation of the proto-oncogene. A more important mechanism with XMRV may be the ability of viral proteins to change gene expression. Several independent groups have found that shortly after a permissive cell line is infected with XMRV, multiple genes are expressed and that these genes could be involved in production of the malignant phenotype. Spadafaro has shown that reverse transcriptase can cause gene activation and lead to the malignant phenotype. In some cancers env and gag may also be important in malignant transformation. A complementary hypothesis is that T-cells are also infected by XMRV resulting in a clonal T-cell expansion. The clonal T-cells produce elevated cytokine levels which may be partially responsible for the CFS. Furthermore these cytokines may have a paracrine activity that stimulates a simultaneous neoplasm to behave in a more aggressive fashion. One objection to considering XMRV a pathogenic virus is that there was previously no explanation as how a murine leukemia virus could have entered the human population. However, early vaccines were prepared by passaging human virus through mice for the purposes of viral isolation and for attenuation. This would have allowed for contamination of vaccines with murine leukemia viruses. The original Yellow Fever Vaccine was made in the early 1930’s by culturing the virus in mouse cerebral tissue. Some patients received both the Yellow Fever virus and infected mouse cerebral tissue. The YF17D strain was used to immunize over 400 million people world-wide over the next 65 years. It was the policy of the U.S. Armed Forces to vaccinate service men for Yellow Fever from the 1940’s through the 1970’s. The polio vaccination trials in the United States started in 1952. The polio virus was passaged through mice, cotton rats and primates to achieve attenuation. Although the Salk vaccine was treated with formalin, many patients received the live oral attenuated polio virus. Indeed, the patient studied here, received the live oral polio vaccine in the early 1950s, fifteen years later developed symptoms of CFS and fifty-five years later developed CLL. He also received the Yellow Fever vaccine in the early 1970’s on entering the Armed Services. In summary, a new patient with both CFS and B-cell CLL was identified. Both his leukemia cells and plasma were positive for XMRV and he had antibodies to viral proteins. He also was positive for a clonal TCRg and had elevated cytokine levels. 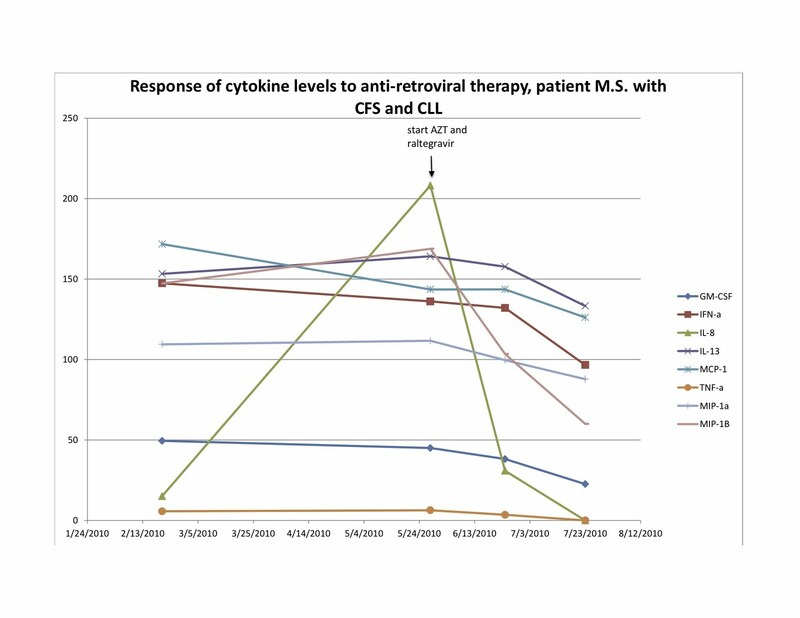 With anti-retroviral therapy he showed improvement in his cytokine levels, CFS symptoms and hematological parameters simultaneous with the disappearance of infectious XMRV from his plasma. Presumably his improvement was related to the anti-retroviral effects of treatment. Alternative explanations for the therapeutic effect of his anti-retroviral therapy have been offered. One of these is “selective toxicity” which has never before been seen with the hundreds of agents use as cancer therapeutics and seems an unlikely explanation for his improvement. Anti-telemorase activity of the AZT has also been considered, but the rapid response to treatment does not fit the kinetics of depletion of telomers. There is nothing unique about this patient’s clinical presentation to suggest that his case is any way unrepresentative. His response to anti-retroviral therapy suggests that XMRV was etiological for both his CFS and CLL and that anti-retroviral therapy might help other patients with CFS and XMRV associated malignancy. Many more patients need to be studied. Ultimately questions that should be answered are what neoplasms are associated with XMRV, will existing anti-retrovirals have activity in these neoplasms and what would be the optimal combination of anti-retrovirals. A lot of the dissension here feels like the squabbling of a lively, dysfunctional family, with lots of crazy relatives:). Lately, there’s been some progress in being more respectful of one another. But this being the internet, there are strangers in our midst, trying to find chinks in our nonexistent armor. That’s fine, for we are here to look at the truth. The naysayers are an opportunity to sharpen our thinking and confront rumor head-on. I decided to blog because I couldn’t stand all the suffering in isolation. Even as a doctor, when my family got sick and started seeing Lyme doctors, there was a feeling that there were people that knew something that I didn’t, a way in which the information wasn’t freely given. I now think that happens because of everyone’s unwillingness to admit what they don’t know, even to themselves. My only serious concern about my outspokenness on the internet has been the recent comments that my being controversial might somehow hurt the WPI. For this reason, in part, I have elected to be a consultant for the WPI, as an independent contractor, rather than an employee. I’ll take this opportunity, in advance of an announcement on the WPI website, to say that the opening of the clinic will not take place in May as hoped, primarily because of financial constraints. Our plans remain unchanged however, and I am hopeful of opening before the end of the year. So let’s take advantage of our devil’s advocate, John, who has questioned both the science and integrity of the main protagonists at the WPI. With permission, I’d like to tell you what I’ve learned about the institute and the people involved. In particular, I’d like to address the oft heard thread that runs something like this: the Whittemores are richer than God, so why don’t they just cough up another few million dollars to save us? Here is the reality. At a time when money was not as big an issue as it is now, the Whittemores, and other concerned patients, joined with Redlabs, owned by Dr. De Meirleir in Belgium, to start VIP Dx. This happened at great personal expense because a clinical research lab was needed to save their daughter, and others. The “and others” make the Whittemores special. They didn’t just have the money. Lots of people have the money. They thought about the problem and applied the money in a way that no one else had done before. It wasn’t about money, but the embodiment of parental love. This all happened well before there was a research lab. XMRV as a cause of CFS wasn’t even a twinkle in anyone’s eye. Everyone knows that Harvey and Annette spent many millions, and raised millions more, to fund an institute so that everyone would be helped. They brought together the necessary ingredients in the form of Mikovits and Lombardi. Having heard the story from each of them and others, it was a synthesis of talent, skill and luck, as genius always is. The WPI scientists support and promote each other’s contributions, a rare thing in the world of science. Also unheard of, everybody passed up any intellectual property rights in favor of the institute. Any interest in eventual profit from the use of the WPI’s intellectual property by VIP Dx was passed to the institute when it was founded. When the Science paper was published, a lab called Cooperative Diagnostics, owned by a scientist named Satterfield, brought an unvalidated test to market for XMRV, even though they had never found it in a human being. Their test was a PCR for a VP62 plasmid. Recently, in an interview with Cort Johnson, Dr. Satterfield admitted that they never did find it in anyone. More of the “I can’t find it, so it isn’t there” insanity. I thought it pretty strange that he isn’t ashamed of having charged people a bunch of money for a test, even though he knew that he had never found XMRV in an actual patient. How can you disprove an association, if you can’t find it all? Dr. Satterfield’s attempt to jump into the market, forced VIP Dx to bring a test to market, even though there had been no intention to do so until further research was done. But the prospect that there would be a flood of negative test results that needed to be immediately challenged forced their hand. At that time, it seemed likely that the major commercial labs would be testing soon, so it was considered a band aid for the short term. The first 10 people who write to me that have a receipt for a negative test from Cooperative Diagnostics will be tested at VIP Dx for free. Email: jdeckoffjones@gmail.com. Also, if anyone received a positive test from Cooperative Diagnostics, I’d like to hear from you. So testing for XMRV is a gold mine, right? Wrong. VIP Dx hasn’t even begun to pay back the original founders, nor can it cover all of its current existing expenses. It pays WPI a royalty (calculated as the net profit for administering the test) that puts it further in the red. Some of the founders donated their holdings or had their holdings placed in trust for the benefit of WPI. And Harvey, who manages the lab, has never been paid a dime. Never. The lab exists to unravel the mystery of our illnesses, as it was intended from the beginning. Here’s the truth. VIP Dx has lost almost a million dollars since inception. Not accountants fiddling with red ink, but real losses. I have seen the actual numbers. Anyone want to donate to the cause? I can tell you that in planning the clinic, VIP Dx is just as important as the WPI translational research lab. Integral parts of a unique whole. Dr. Lombardi will make available any testing that our doctors decide we need. He is looking into the tests I have asked for, so that they will be available when we open. They recently moved into their new state of the art facility next to the clinic, a tremendous undertaking. All testing done in the clinic will go into our database, so contributes to our overall understanding of the illness and how to approach it. So why don’t the Whittemores give some more money? Because they don’t have it at the moment. If they did, they would. In my opinion, everyone who has spent a few dollars on an XMRV test from VIP Dx is contributing to the greater good. The sooner we start to think about the illness as related to XMRV, or another related but unspecified human gamma retrovirus, the better; it will affect those we tell. Personally, I’ve had good luck explaining my illness to the uninitiated as “a newly discovered retrovirus like HIV that isn’t fatal”. We are in much better shape now, with our decisions informed by this understanding, than we were before. Understanding is everything to me. For that reason, no matter how it all turns out, I owe my hugely improved quality of life to the Science paper. I’m still sick, but living in the light. As for Dr. Mikovits being right or wrong? She questions herself every day, as any real scientist would. Clearly, she (and the WPI) were unprepared for the thousands of desperate patients who turned to her, all needing immediate help. She is a deeply compassionate person and has trouble telling patients that the science is going to take time. She bleeds for us. A consummate scientist, not a politician, she is under unimaginable pressure, caught in the center of the perfect storm. We all owe her a debt of gratitude for what she has already given. Finally, I have spent time in the labs of both Drs. Mikovits and Lombardi, in two different places many miles apart. They can both grow the virus. Not from everyone, but in a significant percentage of patients. I wonder how they keep contaminating only some of the samples. To John. I will address your objections 1-8, 9, 10, 11….99, 100, etc. in a future post. But it is my belief that if you use the methods, materials, and processes outlined in the Lombardi paper, in an appropriate sample, you will find XMRV. Other labs besides these two can find it. We know that there are plenty of people out there who can design and complete a PCR study looking for XMRV and not find VP62. They know, and we know, that they are looking for the wrong XMRV and using the wrong methods, materials, and processes. It is that simple. I speak to a lot of doctors. It is common to hear that they do a bunch of elaborate tests that let them “individualize” treatment. They feel they have identified The Defect, and can address it, in this way or that. There will be an overly intellectualized theory, but mostly, the strategy involves replacing a substrate, using a little known intermediary, or overwhelming a block in a metabolic pathway. That strategy can make the difference, though it often doesn’t, because no matter how far you take it, you don’t know enough. I know a woman who was housebound for a decade who was able to return to work after she started B12 shots. But for every one of her, there are an awful lot of people for whom B12 made no noticeable difference at all. To make matters worse, an intervention might not work, but “work” at another time for a given patient. For every case of something definite that brought about a remission, I hear about a few spontaneous ones, even after many years, where there was nothing that could be identified as making the difference. One of the most tantalizing things, and you hear it regularly, is that something worked for a few days, and there was a taste of almost normal. That implies reversibility. The blog has a tracker that shows the most recent readers on a map of the world. There is often someone tuning in from Tromsø Norway, at the top of the world. It is interesting to note that MS is more prevalent in northerm latitudes. The very extreme form of ME, which seems to be more common in Norway in particular, reminds me of an adult form of autism in a sicker body, with PEM and pain thrown in. ASD looks different because it occurs in the developing brain, but the obvious commonality of symptoms is there. Extreme sensory overstimulation. Can’t stand light and sound. Problems with touch. Problems communicating. Concurrent GI dysfunction. We haven’t heard from the Gulf War Illness community here yet, but it seems to me, it is the same illness. I had more of a GWI, than typical CFS, presentation. If it’d been a couple of years earlier and I’d been a soldier returning from war, instead of a post-partum ER doctor, GWI would have been my diagnosis. I had olfactory hallucinations, or flashbacks, of the worst burn case of my career. I now think of them as 1rst cranial nerve discharges, rare and without emotional content at this late date, but it seemed pretty classic PTSD at the time. My psychiatrist called it “vicarious PTSD” from the ER. Do you believe it? He didn’t even let me own my own trauma. I said it felt like the flu. I used the word malaise. Psychiatrists have done me a lot of harm. But I shouldn’t single them out; it’s just somehow more personal. But the rest of my doctors and dentists, in hindsight, mostly chose the stupidest thing too, because of profound misunderstanding of the illness and disbelief. And speaking their language didn’t help at all. Being unable to depend upon the stability of the ground beneath me has been a tough, but effective, teacher. I don’t sweat the small stuff anymore. Acceptance is my mantra. My uninsulated wiring and limited physical ability require a simplification of thought and action that in the end boils down to common sense, something I didn’t always have. I have learned to ride over the bad moments and find great joy in the good ones. It is all very close to the surface. I spoke to a woman last week who referred to herself as “an idiot savant”. That struck a chord in me. We have all had to learn to live with diminished capacity. For me, functioning requires first surrendering to the illness. If there is a silver lining, it’s easy access to my own truth. I don’t over-think things or worry much any more. It already happened. It’s become about what I can do, instead of what I can’t. P.S. My email has gotten away from me, as it is very heavy. The survey has taken a lot of attention. If you emailed me about something important to you and I missed it, please resend. Once in a while, if I think about a question too much, it doesn’t get answered. Sometimes I have nothing to say and don’t answer because I think it might come to me. I read every word and am sustained by hearing that it is helping in some way. Your emails make me think and care. I try to cover recurring themes here. At this juncture, with the science in an embryonic state, I am in favor of the most inclusive definition. The only problem with non-HIV AIDS is that “Deficiency” isn’t exactly right, though the disease can clearly progress to an immune deficiency, just not a devastating one like endstage HIV. Dysregulation would be a better word. However “Acquired Immune Deficiency Syndrome” unrelated to HIV, is close enough for government work, and the name evokes what it should. Before the causative agent of Hepatitis C was identified, it was clear that there was another infectious virus that caused hepatitis that had a different clinical course than either Hep A or B. This is exactly analogous to that. We will eventually have a laboratory profile that is inclusive of all the cohorts, or maybe I should say, factions. Neuromyasthenia isn’t a bad name. It takes into account the full history of the phenomenon, but the overemphasis on muscle is inappropriate for many and it leaves out the immune problems. It also brings “the vapors” to mind for me for some reason. I haven’t heard a perfect name. Another new acronym won’t take at this time, even if accurate, because everything is in such a state of flux. It will all be easier when the causative agents are identified. For now, non-HIV AIDS explains it in very few syllables. Even a doctor should get it. AIDS has case surveillance criteria that include “AIDS-defining conditions”. Revised Surveillance Case Definitions for HIV Infection 2008. If you are HIV positive, whether you get PCP or Kaposi’s Sarcoma, it is still AIDS. Whether you have HIV dementia or not, it is still AIDS. It is the same for us, whether you have HHV-6, Lyme Disease, CLL or ASD. I don’t like any of the existing case definitions, though most full-blown cases are caught by the Canadian Criteria. Using us, as examples; I didn’t have a viral onset and I don’t have sore throats, fever, adenopathy. I got sick post-partum with various neurological symptoms which were all transient. I was always hyperimmune. I worked in the ER for 16 years; I was exposed to everything and never caught anything. I’ve had an influenza a few times, including Swine Flu, which was no big deal, but that’s it for viral illnesses, other than childhood illnesses, all of which I had naturally before my early teens. However, I had persistent Babesiosis despite lots of treatment, so that’s pretty immune deficient. I have never met CDC criteria. I meet Canadian Criteria (6/6), but didn’t for the first decade of my illness. As for ME? I didn’t have PEM for over a dozen years, though it’s bad now, and I still don’t have problems with cognition or memory. I have sensory deficits. I have a positive Babinski and Rhomberg. I have mini-clubbing that started before my first crash. I have low titers of autoimmune markers, sometimes. I am XMRV positive. I’ve had negative nerve conduction studies. I have been given many diagnoses over the years including chronic Lyme Disease, fibromyalgia, Crohn’s, PTSD, dysautonomia, arrhythmias, peripheral neuropathy, Raynauds, atypical migraines, intestinal migraines, pain syndrome of unclear etiology, most recently CFS. I have recurrent hypertensive crises. I have a sleep disorder from being an ER doctor, predating my illness by many years, but it’s much worse now. I am probably an Ehlers Danlos variant. I have become more flexible with each major exacerbation of my illness. My wingspan is greater than height, though I am short. Ritchie Shoemaker says my genes are “poison”, but Ali “drank” the lesser of the poisons. What do you think I have? Ali is more classic CFS, though she also had an onset that was related to a major hormonal shift, and her illness responded to oral antibiotics for years. She does not meet CDC criteria. She does meet Candian criteria, except when she doesn’t. No sore throat, fever, nodes. She catches viral illnesses very lightly; barely registered Swine Flu. She has had inflammatory skin stuff since she was little, predating illness. She has a history of treatment resistant Lyme Disease, atypical migraine, a mild cerebral vasculitis and leukocytoclastic vasculitis twice from PICC lines. She has POTS. She has a little brain fog that comes and goes, but is really sharp mostly. Little sleep issues, but not bad. She has PEM, but didn’t always. She has a little MCS. Not much pain. She is XMRV positive. Do you think we have different diseases from each other? From you? There is aggressive prostate cancer, Parkinson’s Disease, Multiple Myeloma, ASD and Marfan’s Syndrome in our family, which is in no way an outlier. The surveys we are receiving look compelling for demonstrating both the genetic and infectious pieces, as well as associated conditions. Thank you to everyone participating. These informal responses are helping us to determine the right questions and how to proceed. Please keep them coming, even if you are an isolated case. Our intention is to proceed with a formal study. There will be a secondary mailing to fill in the blanks and provide consent for publication. If you’ve sent in a survey, please stay tuned over the next few months for additional requests for information, and if you change your email address, let me know. It is completely outrageous that the epidemiology has not been formally studied by our government agencies over the last decades, while so many people were getting sick. How did they let this happen? How come the Center For Disease Control has never even looked? An obviously infectious disease spreading through the population for decades. Whole families affected. But they buried their heads in the sand, because it wasn’t straight forward. It was easier to think the patients were lazy, crazy and faking. After all, they were an unusually labile bunch, hard to deal with, quite hysterical sometimes, and so fixated on their symptoms, which any good doctor could tell, couldn’t be a real disease. No wonder the people responsible can’t let it in. Imagine realizing that you were one of the people who allowed an incurable infectious virus to invade a second and third generation, ruining the lives of millions of people. No way to contain it anymore. The health of the species affected on an evolutionary scale. Just because you were wrong. That could make for some serious denial. So, we will study the family piece ourselves. With talented, sick volunteers. Without funding. For free. Watching Harvey Alter, Judy Mikovits and John Coffin on YouTube struck me as life immitating myth. Spock, Kirk and the Klingon. Yoda, Skywalker and Darth Vader. God, Moses and Pharaoh. Dr. Coffin’s conclusions don’t make any sense to me. Let’s for a moment say he is correct and XMRV was created in the lab in the early 90’s. It is still a xenotropic MuLV related virus, capable of infecting human cells. Why does he think it couldn’t have infected humans in the lab and gotten out that way? Because there were sick patients before the event? A more likely explanation would be that there was already something else out there before this one. It’s not clean and neat, so let’s all close up shop and go home for another couple of decades. Even he said there could be another retrovirus. And why pray tell isn’t he looking for it? The patients have something consistent with retroviral infection. You won’t find it unless you look. The discussion of the name is a sad one. I don’t have much of a stake in the name. I don’t mind CFS that much and I don’t think it’s going to go away. I think of the word fatigue the way materials, like metal, can become fatigued. I don’t like ME much either because I think it’s stigmatizing in another way. It implies we’re all brain damaged, encephalopathic, and I believe the damage is mostly reversible. I like non-HIV AIDS. The case definition discussion also seems besides the point to me. My belief is that the presence of infectious retroviruses is the only true biomarker for the disease and we don’t know what is there yet. There are clearly XMRV negative people who are clinically indistinguishable from the positives. Those people shouldn’t be excluded from a diagnosis. Like Hep C used to be non A non B hepatitis, I think our disease should be called non-HIV AIDS. Personally I think that the people excluded by this or that set of criteria mostly do in fact have the disease. Another problem with definitions is that it is a relapsing remitting process. People who meet a set of criteria today, may not tomorrow (thank God). Case definitions and new names aren’t going to save us. The only biomarker for the disease is the detection of the responsible retroviruses. For now, that is XMRV, but there will be more. Until then, we can only measure downstream effects, cytokines and NK cell profiles, inflammatory markers, a few other things that demonstrate how sick we really are. Our down and dirty survey is producing fascinating unanalyzed data. We’ve already refined the questions slightly based upon what’s coming back to produce a more complete picture and thank you to everyone who has responded to requests for further clarification. We will report. For now, the impression from reading the surveys is that many CFS patients have family members with CFS and associated diseases. Please spread the word and encourage everyone with the disease to reply, whether you have an affected family member or not. If any statisticians or epidemiologists are interested in participating, please get in touch. I thought this article about Google’s founder inspiring and relevant to our predicament: Sergey Brin’s Search for a Parkinson’s Cure. The blog’s readership has been growing recently, currently averaging well over 1000 pageviews/day. Not a big number in internet terms, but still an awful lot of people. Knowledgeable people, because it isn’t exactly easy reading. Dr. Snyderman and I have been discussing how we might use the blog as an investigative tool. Polls with self-selection are not statistically valid but may provide clues about what to look at in a more formal study. In this case, we are hoping to demonstrate patterns of transmission. As an initial exploration, we’d like to get a sense of how many ME/CFS patients reading have family members, by marriage and blood, with ME/CFS or other neuroimmune diseases. Include ASD, GWI, MCS, atypical MS, fibromyalgia, chronic Lyme Disease, other. Include neurodegenerative diseases, MS, ATLS, Alzheimer’s, Parkinson’s Disease, other. Note inflammatory bowel diseases, IBS, Crohn’s and UC. Note any prostate cancer, leukemia, lymphoma, other cancers. Also please include neuropsychiatric diseases, PTSD, OCD, bipolar disorder, other. Do include subclinical disease. Please err on the side of inclusion. If you are familiar with the Canadian Criteria for CFS, note if you meet criteria or not. We are asking ALL readers with ME/CFS to send an email, even if you have no other affected family members, in an attempt to have a denominator. If your spouse/partner is ill, report as a family member. Please present the information with yourself first and family members listed below, in the following format. If ME/CFS diagnosis, are Canadian criteria met? Do you have a spouse/partner? How long together? Is your spouse/partner (or an ex-spouse/partner) ill? If yes, do you think you became ill independently (both ill prior to meeting)? Please provide details. How many unaffected children do you have? Were unaffected children breastfed or not? How many unaffected siblings do you have? Do you think that a vaccination was implicated in yours or a family member’s illness? If yes, provide any details remembered. Have you or any family members been tested for XMRV? If so, please report results. All information will be kept confidential and used for statistical purposes only. The surveys will only be shared with involved physicians and biostatisticians. Results will be shared publicly. Please share the link to this page, but it would be helpful if the survey were NOT posted elsewhere in full (except for translations, thank you! ), as we’d like to track responses as a percentage of pageviews. If you have no affected family members, please put NEG in the subject line. Can we give it a rest for now? I don’t want to moderate or censor, so I’ve let the mold war go on, but it was a little like being kidnapped, since the rest of the discussion died. I felt unheard; it’s annoying to be told again and again that your observations of your own triggers are incorrect. As I believe I made clear, I support the mold warriors theory in part, just not to the extent they would like, but that makes me a dissenter. On the other hand, I got mail blaming me for giving them a forum. And mail holding me responsible for other peoples comments! Maybe I’m dreaming, but I’d like to think it’s possible for us to come together and further the discussion without overwhelming it. I did ask them back channel to have their say and let it go for now. It will come up again, no doubt. It seems a good time to ask everybody, please, could we try to show a little sensitivity to the rest of the group? We are a sensitive bunch. There is lots of disagreement. Contradictory ideas abound. Rumor has it that when I started AZT, a well know CFS doctor predicted it would kill me:). We’ve lived in the dark for a long time, but it should be different now. We have a framework from which to further the discussion. We are in a place to finally figure it out. Mold fits as a trigger. Anything that turns on an inflammatory cascade favors the virus, maybe even “ick”. I appreciate Dr. Enlander’s considered comment. I like you too Derek, and I appreciate that the financial realities of studying Ampligen are not of your choosing. Personally, it would take a lot to get me to undertake long term intravenous treatment again, without a very good statistical chance of success, and I just don’t see it here. The data presented looks like 16 of 100 people will do better than placebo. Presumably a few of them will do really well, but a few will do worse. Not very good odds. Maybe a little better if you’re XMRV positive. I haven’t seen anything about adverse events. People are writing to me that they are desperate to access it, despite its being financially out of reach. It involves paying out of pocket for the drug, the doctor and, in many cases, relocating for a long period of time, enduring two infusions per week, and the effects are temporary. I think I’ll wait this round out, thanks. I am feeling a little worn out by all the contentiousness. We need to lift each other up, not bring each other down. There must be a way of sharing without clobbering one another. Our goals are aligned, even if we are not all on the same page at a given moment. We all have enough troubles without fighting amongst ourselves. Once a virus is endogenised, it is forced to follow the evolutionary rate of the host. Since XMRV is integrated in cell-lines the virus evolution is restricted to the host’s pace of evolution, and viral descendants have none or minimum sequence diversity. Thus, if a contaminated product, previously cultured in cell-lines, is administered to people then the infections would provide the evolutionary patterns reported by Hue and colleagues. If the immunological data reported by Lombardi and colleagues are correct, then we need to trace the common source for these infections to prevent possible public health concerns. Products from cell-lines should be the first candidates. Good news, though I think his conclusion about person to person transmission is incorrect, based on the epidemiology. At least it says that a few people in the scientific community, including the editors at The Lancet, are thinking about what we need them to think about: Where did it come from? How did we get it? A big step up from: Is it there? I am still responding to the firestorm brought on by my use of the words “entitlement” and “unsympathetic”. I am not a professional writer and the printed word lacks affect, though I’m pretty blunt in person too. Words can be taken out of context as sound bytes, as happens when one talks to reporters. I notice that there is a tendency for some people to fixate on a particular sentence or phrase. It’s scary, but all I can do is ask that everyone please take it all in the spirit it’s offered. Two important clarifications. I did not in any way mean to imply that the government should not be on the hook for figuring it all out, or that there may not have been criminal events that took place at the CDC. I actually think it likely that crimes against humanity have been committed. Also I was not trying to minimize the neglect and abuse to which we have been subjected. Everybody knows how I feel about most doctors. All covered in many previous blogs. I was talking about how we behave and how we appear to caregivers, doctors, scientists, the media. A separate issue. I say “we” because it happened to me. It is the interface between the physical and mental, physiological and psychological. The disease brings out the worst at times and that is a piece of what leaves us alone, whether there’s still family around or not. I’m writing about it because I found a way out, at least for the time being, and it is helping me to minimize my own suffering. A spiritual perspective and positive attitude help. Helping helps, if there’s anything at all that you can do. Now we can even explain the physiology of why that might be true with respect to a stress activated retroviral infection. I am not religious, so that isn’t where it’s coming from. Toni Bernhard wrote about it in her wonderful book How To Be Sick, and in this clear interview about suffering, and our resistance to it. Lots of people have figured it out. The Buddha said life is suffering (not exactly, but close enough). Then he outlined the way out. I’m not a Buddhist. Not even a Jewish Buddhist. I’m talking about what may work for alleviating suffering, even practically speaking, like all the things on my list of things to consider. Many people have expressed concern for my health and I am profoundly grateful for your good wishes. I am holding up well, maintaining my usual state of poor health. It is wonderful to be useful again. I’m feeling like a lightening rod, but I guess I asked for it. I thought about making people sign in and tell us who they are, but that would keep some people away whose thoughts we would like to hear, so I’m going to leave it alone. Dissenting opinions are welcome, and no need to be apologetic, but I ask that everyone be civil and I do encourage leaving real names. You know who I am; I’d like to know who you are. Please don’t take your frustrations out on me. I don’t want to moderate, and I want everyone to have a chance to have their say, in a considered way. The few who have needed to lash out have been more than offset by the statements of personal triumph by people finding meaning in their lives despite the losses and injustices they have suffered. The list of treatment options that I posted a few days ago is a work in progress and I hope it will be viewed as such. One of my concerns is that things will be lifted from the blog as my prescription for everybody. The downside of this blog for me is that I may get quoted incorrectly. Also my opinion may change. So I ask everyone to respect that I am sharing my thoughts openly in real time, and not put the list out there as Dr. Deckoff-Jones’ treatment protocol, written in stone and never to be changed. It’s for discussion. I have added a few things to it since I posted, from your suggestions. Keep it coming. Like everything I write, I am putting it out there in the hope that it helps someone. I AM NOT TELLING ANYONE WHAT TO DO. I am sharing my ideas. There may be inconsistencies that I’m working on. Please contribute your experiences. If you disagree with something, don’t attack me or be defensive yourself. Just tell us why you disagree. Maybe we can figure out how to have the discussion without people becoming hot and bothered. But if not, we’ll forge ahead anyway. Dr. Strayer concluded that there was a 70% greater than average exercise response in XMRV+ subjects, and a 40% lower response in those who were XMRV-. Medication use was monitored in all of these subjects as well. 53% of XMRV+ subjects were able to reduce their use of symptomatic medications, while only 32% of XMRV- subjects were able to reduce medication use. These aren’t exactly stellar results given all the wear and tear, unless of course you are one of the lucky ones. Dr. Mikovits reported in her Santa Rosa talk that about a third of the patients she has looked at had evidence of viral activation when treated with Ampligen (unpublished). So her observation, in addition to the less than exciting anecdotal evidence, gives me serious pause, but apparently a multi-site study is forthcoming, so we will have more information to consider. At least someone is studying something with respect to treatment, though it is the first clinical trial I have ever heard of where the patients are paying for the drug. While waiting for the results, I guess it is up for consideration, so I added it to the list with a question mark, but it’s a big question mark. Personally, I am not interested at this time. The Chronix experimental approach analyzes fragments of DNA often released into the bloodstream during the process of apoptosis or programmed cell death. Chronix is using its proprietary technology and advanced DNA sequencing platforms to measure alterations in specific regions of the chromosome, which can be detected as distinctive “signatures” in cell-free blood-borne DNA. By focusing on these signatures, Chronix’s technology can detect the presence of disease-damaged cells in simple blood samples without needing to biopsy diseased cells or tissues. “Our technology—based on DNA released into the bloodstream by dying and damaged cells—taps into the dynamic information provided by the genomic alterations unique to each diseased cell. We capture what is happening to the DNA very early in and throughout the disease process, in real time, and patient by patient. That’s how our approach differs from other tests that focus on static genomic data or protein biomarkers,” said Dr. Urnovitz. The patient-unique signatures captured by the Chronix technology may prove useful as a companion diagnostic – a test that is used to help guide treatment decisions – and to provide information about the disease process to help pharmaceutical companies select the most efficacious drug candidates. The Chronix approach has been validated in a number of peer-reviewed settings. At the ASCO meeting in June, Chronix researchers presented data showing that its assay detected breast cancer and invasive prostate cancer with 92% sensitivity and 100% specificity. Additional published studies have demonstrated that the Chronix technology can identify the presence or absence of active disease in multiple sclerosis patients, and that it can accurately detect early stage breast cancer with high diagnostic sensitivity and specificity. A number of people have asked me what supplements I take. I have swallowing and appetite problems. If I take all the things I would like to, it’s a small meal that doesn’t go down well. When I take supplements, I take Meriva SR, B12 (in addition to Deplin), NAC, glutamine, L carnitine, CoQ 10, Vitamin C and undenatured whey protein. I also take Hawthorne tincture sometimes. I have never noticed a difference from a supplement, except transient effects from high doses of single amino acids. I have responded to herbs at times, especially teas. I miss Deplin if I stop it. There are other supplements that make sense with respect to what is known about how supplements impact HIV. I’ll discuss those ideas more in the future. The active form of Vitamin D, D3, is a hormone with effects all over the body, including regulation of the immune system. Vitamin D ligands enhance NK cell and macrophage function. Supplementation for inadequate levels is very important. I left it off my list initially and one penpal reminded me that Vitamin D3 supplementation is the only thing that ever helped her noticeably. Levels should be followed. The literature is vast. Here, for the flavor, are a few abstracts from the last couple of months. Antibiotics again. I am in support of using antibiotics if they work. I think the ILADS guidelines are dangerous with respect to their recommending long term intravenous drugs in combinations for years, even if it’s not clear they’re working. I did it. It didn’t work. It hasn’t worked for many people. It appears to work for a few people, like anything. There is no way to know if those people got better because of their treatment or despite it, because some people get better slowly anyway without treatment. Putting it all together, some people need a long term oral antibiotic to maintain a level of poor health, maybe because Borrelia burgdorferi is being suppressed, or maybe not, but it’s obvious that those people should continue their antibiotic. It is also rational, if you think Bb is the problem and it’s been there for a long time untreated or the patient is immunocompromised to try and clean them up with IV antibiotics. If they respond partially, you might want to continue for a while, duration to be determined within the confines of the doctor patient relationship. If a patient responds to IVs they should be offered orals after. Babesia, if present, should be treated in a symptomatic or deteriorating patient, but treatment doesn’t always get rid of it. I am aware of the apparent inconsistency, mentioned by several people, that I am “for” antiretrovirals and “against” antibiotics. I hope that what I’ve written above clears up part of it. I listed anitretrovirals, not because I think everyone should take them, but because I think they should be considered, like everything else on the list. The option should not be buried because it’s not a cure. There is no cure. The list is in no particular order. I suppose I listed antiretrovirals first, because it’s the thing on the list that is hardest to access, but should be up for discussion, in my opinion. When I started taking them, I expected there would be a viral load measure available by now, and there isn’t. That makes it a tough call with respect to where to go from here, needing to make a decision in the dark. I can say without qualification that for me, antiretrovirals are much easier to take than antibiotics, but it is not an either or. The responses I get from the Lyme community are sometimes irrational. They feel I am attacking the only help they have, their LLMDs. But I am attacking the extremely faulty guidelines that ILADS continues to put out there to influence unsuspecting physicians. I know quite a few doctors who treat Lyme and are most definitely “Lyme literate” that don’t belong to ILADS, or did and have quit. They resent that they are being painted with the same brush. If you have a good Lyme doctor, I hope he or she will consider my ideas. I am most certainly not attacking any doctor who wants to figure out how to help patients. ILADS was a good try. I was a member for six years. Time to move on. My opinion. Everybody gets to do what they want. As for privilege. I grew up with advantages. My husband grew up poor. We’ve had money and not had money. It’s better to have money, but money and privilege are in no way protection from the disease. The real privilege I have, is the privilege of perspective, and that perspective is growing from your contributions. I am all for angry advocacy, as I’ve said. I think we should do something dramatic, like camp out in front of the CDC this summer and throw fake blood on the steps in a proper demonstration, demanding big time funding for a change. CFS, ASD, GWI all together. A lot of people. In the Lyme community anger problems are called “Lyme Rage”. Like anxiety and depression, anger problems are common in neurodegenerative diseases, but blind striking out works against us. It turns off people that we need, reasonable people with normal lives who would like to help. We want what people with other diseases get, compassion, so we can stop saying we’d rather have cancer or AIDS. We are in need of help. When asking for help, one should remember the costs and rewards to the helper. The feeling of compassion for another is it’s own reward, but it’s hard to be compassionate when under attack, too busy turning the other cheek or striking back. This discussion of who suffers the worst seems to me to be at the heart of the problem at hand. How do you come to terms with the anger and loss, while maintaining or growing compassion for others? There is a small subset of CFS patients that are unbelievably sick and stay that way for a very long time. A living hell. A contender for one of the worst things that can happen to someone. Yet, even they sometimes have some spontaneous recovery. In that way, we are lucky. And it’s important for those that are not so sick to know that this is not where the disease always goes. It doesn’t usually get so severe and there are ways to move it in your favor. We don’t know why some people get so sick and others don’t. But getting sick isn’t a given, nor is progression. Though there are clearly stages to the disease, there may be ways to slow progression. There was a very sad comment by a woman who said she hadn’t been touched since her doctor shook her hand in January. Touch is a basic human need. I often think there needs to be communal living with assistance for CFS patients. To the woman who wrote that comment. I know many of us wish we could hug you. The energy I get from friends in the ether helps me. Not the same as a hug, but something. It is important to know who you are mad at. It’s not us against the world. We won’t get anywhere that way. We need to differentiate between our friends, the misguided who should be forgiven and a few evil people who don’t deserve our forgiveness. We will grow if we can have compassion for others who suffer too. Nelson Mandela spent 27 years in prison, came out and worked with his jailers. He helped his countrymen much more by working for reconciliation than if he had needed to spit on his captors.